Nikao, staged the biggest upset in round eight of the Van’s Premier Men’s competition after downing Puaikura. Nikao worked on their flanks well with speedy Avinesh Chand making some good breaks but unable to get his passes across to the strikers. Both teams took a cautious approach in the opening spell with end to end action, including some aimless passes and kicks, to head into the break for a stalemate. After a relentless effort and some desperate defending, the determined home team managed to score the first goal of the match with some crafty play from midfielder Jack Shah, who with his deft touches fed striker Samueal Koaitu in the 49th minute to hand Nikao a one goal to nil lead. Puaikura fought back hard but were unable to get past the Nikao Sokattak defence. Nikao spurred by the home support maintained their tireless effort and were rewarded in the dying stages of the match after Cajun Willis smashed home the winner to seal the two goals to nil win. “We want to play football and you can see some resemble of that in the match but we still have work to do in some areas,” said Nikao Sokattak Coach Alex Napa after their win. “The plan is to build this team for the next year and that’s why we are playing a lot of young players”. In the other Van’s Premier men’s matches on Saturday, Matavera beat Titikaveka three goals to nil . 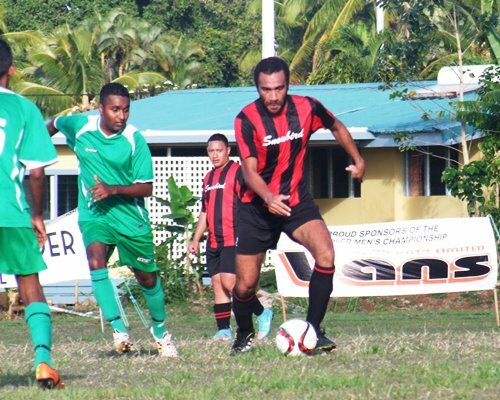 On Friday Tupapa Maraerenga beat Avatiu two goals to one to maintian their lead on the points table. In the Islander Hotel Senior Women’s matches on Saturday, Nikao beat Puaikura three goals to one and Matavera beat Titikaveka one goal to nil. At the CIFA complex in Matavera Takuvaine and CIFA Under16 Academy girls match ended with a two goals all. Thursday’s Islander Hotel Senior Women’s matches, Avatiu went down to Tupapa Maraereng six goals to nil.